Food 52: “How to Make Bread Pudding Without a Recipe,” by Catherine Lamb. Lamb walks through the simple, flexible formula for making bread pudding, which you can then adapt with any flavors you want to make your own recipe. It sounds so good. I’m envisioning some cinnamon-raisin bread pudding with walnuts glazed out of the oven—sort of like a bread pudding version of cinnamon rolls. New York Times: “Ramen’s Big Splash,” by Pete Wells. It’s no secret that ramen is hot right now. No longer just something starving college kids cook from a plastic packet, ramen with interesting, quality ingredients is everywhere now. Wells discusses its emergence. The story includes a very helpful slideshow on the proper way to eat a bowl of ramen; apparently I’ve been doing it all wrong. 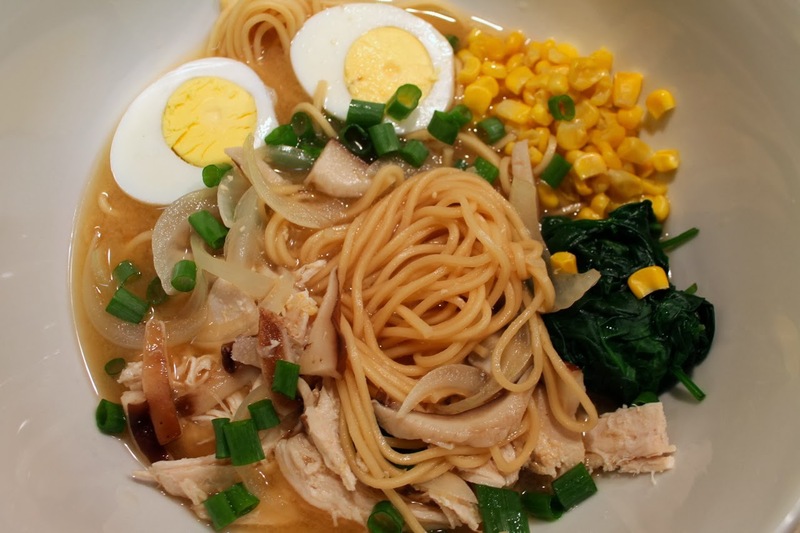 Check out my recipe for Chicken Miso Ramen (pictured above). Washington City Paper: “This Secret Document Helps D.C. Restaurants Keep Tabs on Food Writers,” by Jessica Sidman. Food Republic shares great ideas for recipes that can use up leftovers kicking around in your fridge. Since I made pizza last weekend, I have a have package of sliced pepperoni that would be just perfect in the Spicy Beans And Pepperoni On Toast With Fried Eggs Recipe. Washington Post: “Dinner in Minutes: Gyros,” by Bonnie S. Benwick. I made gyros before and was underwhelmed with the results. But Benwick’s Dinner in Minutes this week has me wanting to try it again. In this recipe the meat is broiled instead of roasted, providing a shorter cooking time and I imagine a crispier outer crust, which is great for gyros (FYI, that word is pronounced “YĒ-rōs” and not “JĪ-rōz”). Forbes: “Sweet And Sour: The Media Decided Fructose Was Bad For America; But Science Had Second Thoughts,” by Trevor Butterworth. Everyone knows High Fructose Corn Syrup is evil, right? Well, maybe it’s not. Butterworth looks at how the almost universal maligning of the sweet stuff has been driven more by the media than by actual research findings. Wall Street Journal: “Don't Call It Fusion Cuisine,” by Rachel Wharton. Fusion is apparently a bad word in the food world, which I didn’t realize. Wharton documents the rise and fall of the term for restaurants that incorporate multiple cultural influences in their cooking, a technique that remains ever popular, even if the term has fallen out of favor. Quartz: “How America fell out of love with orange juice,” by Robert Ferdman. Used to be I had a glass of orange juice with breakfast everyday. Last time I did that regularly was years ago, and apparently I’m not alone. Per capita orange juice consumption in the U.S. has dropped 40 percent in the last 15 years. Ferdman looks at the reasons behind the decline. I don't often click on the stories you feature in "The Feed," but I wanted to check out Sidman's secret document. Fascinating. I was horrified to read food bloggers are "in it for a free meal." Let the record show you always pay your own way. That part was rather mean. I'm sure there are bloggers like that, but I know plenty of others who, like me, pay their own way and give the restaurant a fair shake. I wouldn't think bloggers who are just in it for the freebies would get very many readers. What would be interesting about it?